While in New York for a long weekend of friends and food I came across this cheese cake! I love chocolate and raspberries and the truffled white chocolate is the perfect balance of flavor and sweetness to contrast the chocolate and raspberry combination. 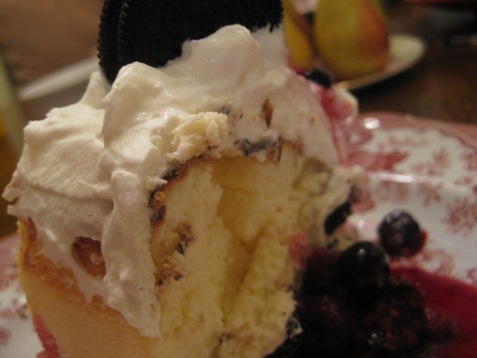 I searched the internet for a recipe and came upon this Cheesecake Factory Copy Cat recipe. 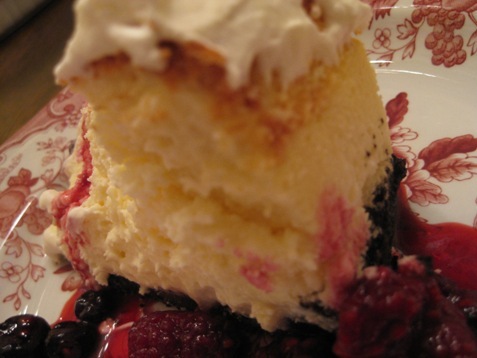 There was a bit of tweaking; for instance, I did not incorporate the raspberries into the cheesecake during baking but rather used frozen berries and a little bit of raspberry syrup for garnish. 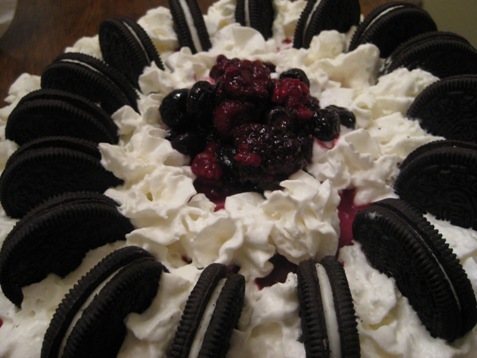 I garnished the cake with the fresh berries and not only did this save me a step but added a texture contrast to the dessert. I whipped the egg whites seperately. 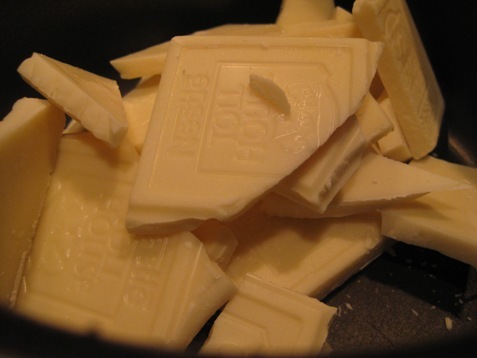 I melted the white chocolate along with some heavy cream and mixed the melted chocolate with the whipped egg whites then folded this mixture into the batter. For me, this was the essence of the “truffling”. 2. Combine the raspberry preserves with 1/4 cup water in a medium microwave-safe bowl. Heat for 1 1/2 minutes on high in your microwave. Stir until smooth. Strain to remove the raspberry seeds (toss ’em out), then let the strained preserves sit to cool, then put the bowl in the refrigerator until later. 3. 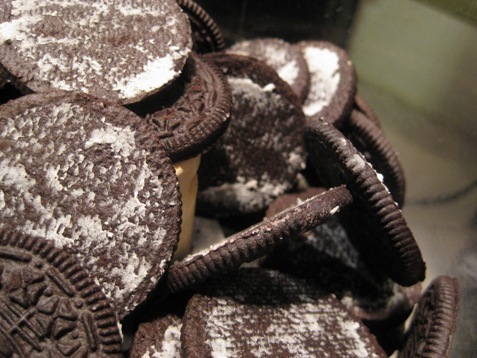 Measure 1 1/2 cups chocolate cookie crumbs (or crush 20 Oreo cookie wafers — with the filling scraped out — in a resealable plastic bag) into a medium bowl. 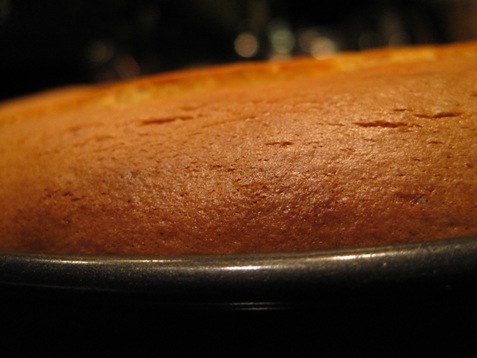 Mix in 1/3 cup melted margarine. 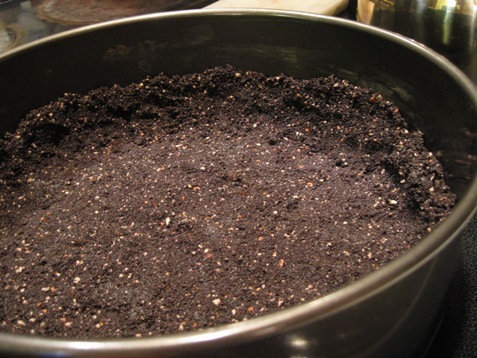 Press the crumb into a 9-inch spring form pan that has been lined on the bottom and side with parchment paper. Use the bottom of a drinking glass to press the crumb mixture flat into the bottom of the pan and about 2/3 the way up the side. 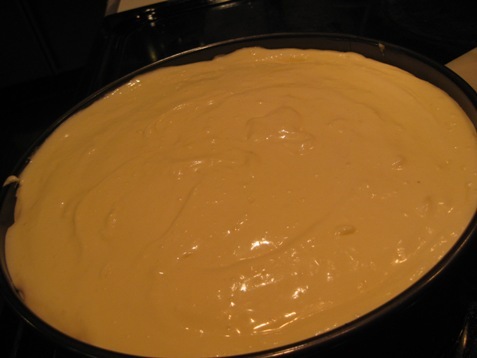 Wrap a large piece of foil around the bottom of the pan to keep the cheesecake in the water bath. Put the crust in your freezer until the filling is done. 4. 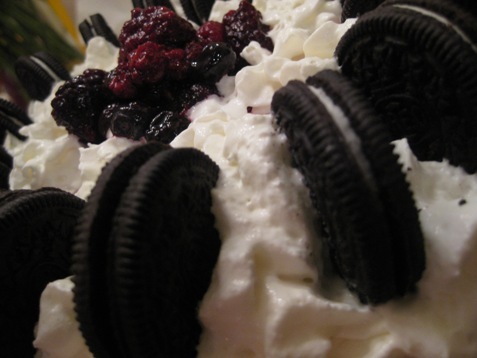 Use an electric mixer to combine the cream cheese with the sugar, sour cream, and vanilla. 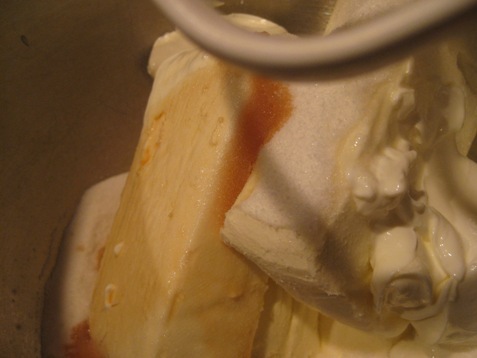 Mix for a couple minutes or until the ingredients are smooth and creamy. Be sure to scrape down the sides of the bowl. Whisk the eggs in a medium bowl and then add them to the cream cheese mixture. Blend the mixture just enough to integrate the eggs. 5. 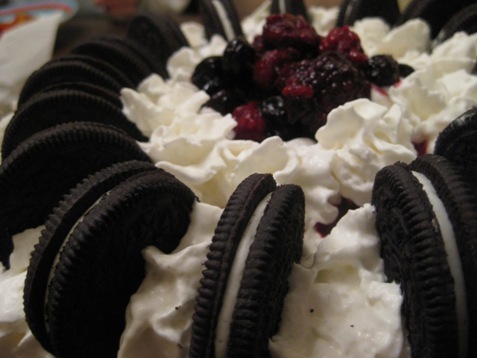 Remove the crust from the freezer and sprinkle 4 ounces of white chocolate chunks onto the bottom of the crust. Pour half of the cream cheese filling into the crust. 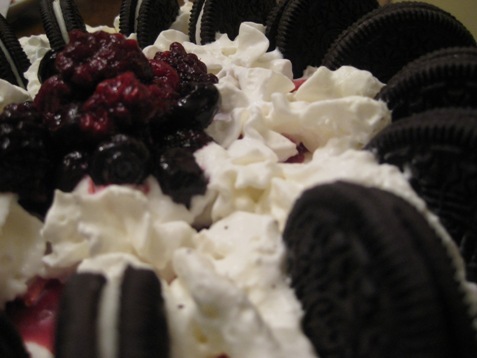 Drizzle the raspberry preserves over the entire surface of the filling. 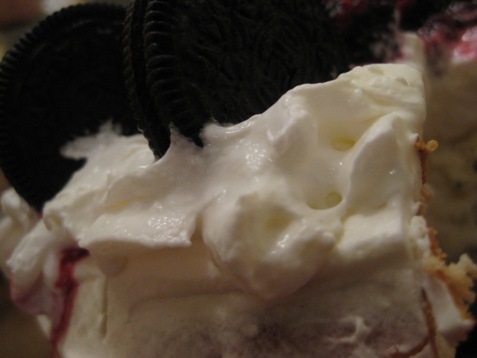 Use a butter knife to swirl the raspberry into the cream cheese. 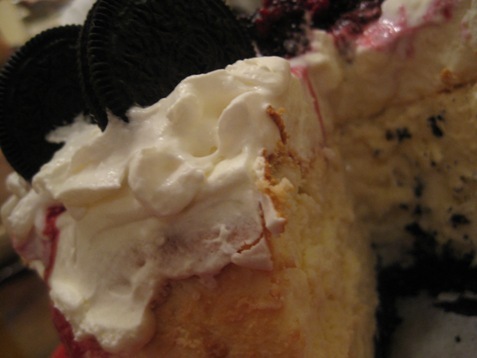 Just a couple passes is fine, you don’t want to blend the raspberry and cream cheese together too much. Pour the other half of the filling into the crust. 6. Carefully place the cheesecake into the water bath in the oven. 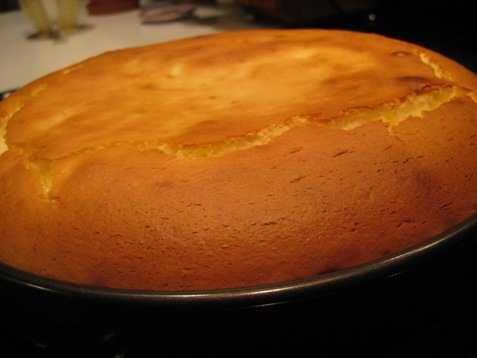 Bake for 12 minutes at 475 degrees, then turn the oven down to 350 degrees and bake for 50 to 60 minutes or until the top of the cheesecake turns a light brown or tan color. 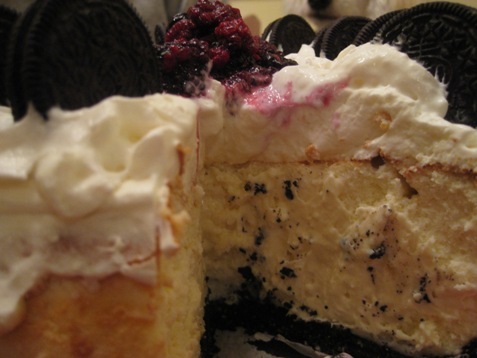 Remove the cheesecake from the oven to cool. When the cheesecake is cool, use the foil from the bottom to cover the cheesecake and chill it in the refrigerator for at least 4 hours. 7. 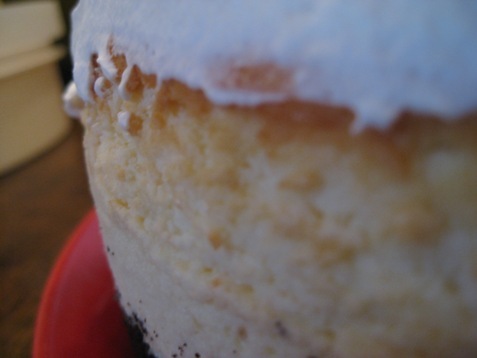 Before serving, sprinkle the entire top surface of cheesecake with 2 ounces of shaved white chocolate. 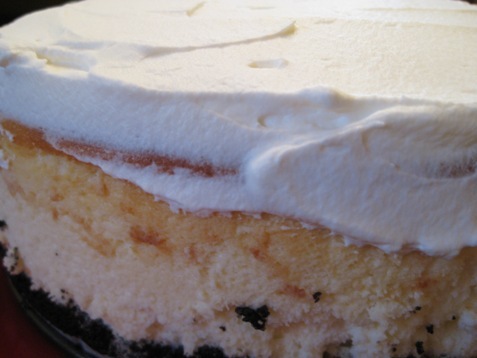 To serve, slice the cheesecake into 12 equal portions. 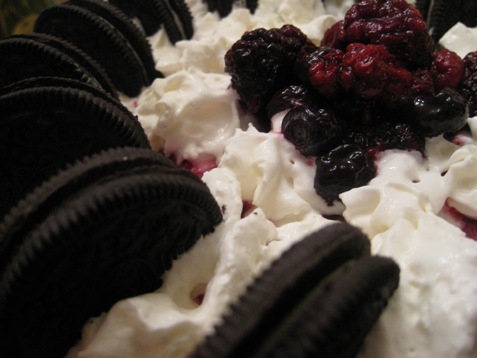 Apply a pile of canned whipped cream to the top of each slice and serve. Ricotta Cheese Cake with Lemon Zest and Honey! Light and Delicious!